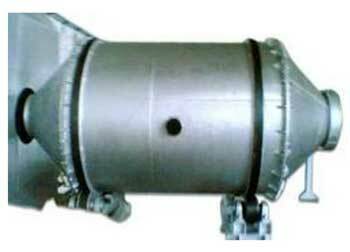 Our Rotary Melting Furnace is a circular furnace with the shell in horizontal shape and 2 fitted conical shape ends. The shell is fitted with two separate rider rings duly machined, which are rotated by four wheels fitted on the bed. The furnace is fabricated in three separate parts. The two supporting rollers drive the furnace with the help of gear box fitted on the bed. The gear box is coupled with an electric motor. The furnace is lined on the inside with suitable thickness of I S 8 grade bricks / insulation bricks. The furnace is heated by means of one no. Gas fired burner fitted on a separate frame.